Sweet and Savory Sisters at the Train Depot in Thomasville! 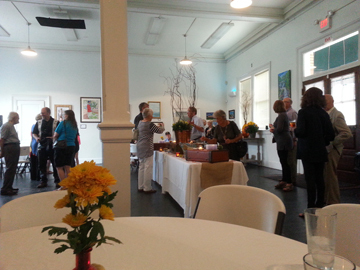 Last Tuesday night, I attended the reception given to us (Wiregrass Gallery) by SASS – the new restaurant in Thomasville. 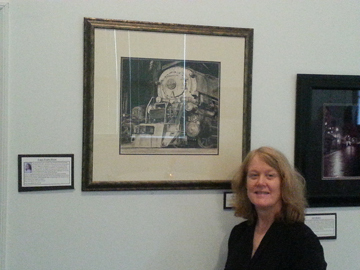 I had such a great time seeing the gallery member artists all in one place (which is rare), and meeting new people. I have a piece hanging in the show there; it will be there until the end of October. I highly recommend visiting! 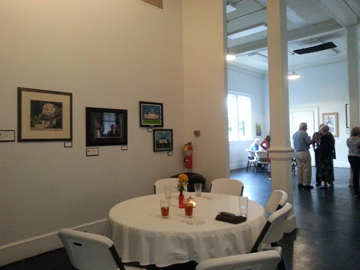 It’s located in the old railroad depot on Jackson St. in Thomasville. The food is delicious – and I don’t say that lightly – there is absolutely nothing there I wouldn’t recommend! I was one of the volunteers that hung up the show – and they treated us to lunch! We could pick anything from the menu – one of the volunteers ordered a 1/2 po’boy with shrimp – it filled up the plate! I had tomato sandwiches – sweet little vine ripe tomatoes on a home-made mayonnaise-based sauce with crispy hot bacon sprinkles on top. It was the perfect lunch for such a hot day. The bread they serve is made there too! Next time, I will have to order the sweet tea-brined fried chicken!